The school is open from 6:30 a.m. until 6:30 p.m., Monday through Friday, year round. Full Day: 9:00 a.m. to 3:00 p.m. The Montessori program provides an extraordinarily rich curriculum of Practical Life skills, Sensorial exploration, Mathematics, Language, Science, History, Geography, Music, Art, Movement, Emotional, Social and Physical development. Children are able to progress ahead at their own, individual rate of development, in a loving, stress-free atmosphere. The classes are un-graded and provide cross-age grouping. The Montessori directress works with the children individually, in small groups, and occasionally in a collective group. The Montessori curriculum is designed to meet the specific needs of the individual child. A lovely balance, built into the curriculum, provides for the social, emotional, intellectual, physical, and academic needs of each child. Extended Day: 6:30 a.m. – 9:00 a.m., and 3:00 p.m. – 6:30 p.m.
To accommodate the needs of our families, the Academy offers Montessori Care for children between the morning hours of 6:30 a.m. and 9:00 a.m. and in the afternoon between the hours of 3:00 p.m. and 6:30 p.m. Extended Montessori Care is available on a regular, daily basis or on an occasional basis. All extended day activities and programs are designed around the principles of a Montessori Environment. The children may be engaged in games, sports, art, music, gardening, dramatic arts, stories, cooking, or a variety of enjoyable options. 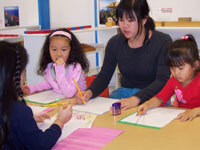 All programs are directed and supervised by Montessori trained staff. 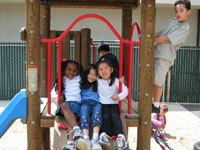 Nominal fees for Extended Montessori Care are based on the usage of this service. Spanish Classes are included as a natural part of the curriculum. The children learn conversational Spanish and as they progress, may come to be able to read and write in Spanish. Optional Programs - The following programs are available, after regular classroom hours, for children. Each program is presented on a different day to permit you to select any of the programs without a scheduling conflict. Chaz Dennis presents an excellent dance program that combines basic jazz as well as ballet. For the beginner, a half hour combination class, focusing on basic movement and coordination, is offered. 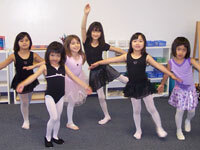 For more advanced children, a forty-five minute class is offered that offers jazz and ballet dancing at a more challenging level. Class meets once a week, in the afternoon, after regular Montessori class. Periodically, the children will perform for family and friends and enjoy the fun of dancing for an audience. Computers are provided in each of the classrooms and are available for the children to learn to explore areas of mathematics, language, cultural areas, problem solving, research and keyboarding skills. 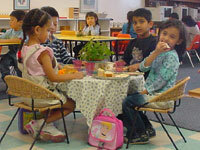 The Hot Lunch Program is available every day. A menu is posted each month and copies of the menu are available to parents. Lunch includes milk each day. Parents may elect to purchase lunch on an occasional basis or on a regular basis. Cash or prepaid lunch tickets may be used to purchase lunch. The Milk Club program provides fresh milk for children during lunch and during the extended day program. Children who bring lunch from home often choose to participate in the Milk Club. Other optional programs are offered after the regular classroom hours and on different days, to permit your child to participate without a scheduling conflict. The office has enrollment forms available if you elect to participate in any of the optional programs. The Academy offers an exceptional computer experience to all students and provides many excellent educational programs for the children. There are computers in each of the classes for the use of the students. Children have the opportunity to develop keyboarding skills with specially designed programs. Additionally, the children are able to explore the areas of science, geography, history, art, research, mathematics, science and problem solving through their work with the computer. ‘Sunshine Generation’ is offered for children once a week. The hour-long class is an exciting, animated opportunity for the child to experience singing, vocal training, dancing, performing arts and develop ‘stage presence’. Direction is given in a positive, enthusiastic manner and children participate joyfully. Children perform for family and friend periodically during the year. Classes are offered each week, after regular classroom hours, for our ‘Young Rembrandt’s’ children’s drawing program. Students learn in a small group setting with encouraging, informative and nurturing instruction. Children’s work is displayed and parents are kept informed of their child’s progress on a regular basis. Art is a natural compliment to the Montessori curriculum and enables the child to apply skills learned in drawing class to all the other areas of exploration in the classroom. 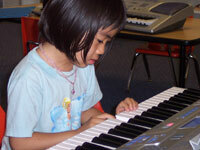 Keyboard classes are offered once a week and enhance the Montessori music program. The classes provide basic keyboard instruction in a very small class of no more than six students. Each child has their own keyboard, especially sensitive to tiny fingers! Children are evaluated on the seventh week of each session to let parents know their progress. Books and music are provided for the children. Periodically the students perform for family and friends. 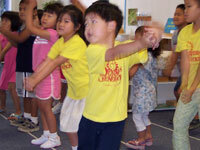 A weekly, after school gymnastics program is offered for the children. Excellent equipment, mats and materials are brought to the class for the children’s use. The teachers are well-qualified and offer an age-appropriate program to help the children develop coordination, motor skills, ability to follow directions, foster physical fitness and confidence.